Cloning an Event Registration has a slightly different process than cloning a regular registration because it's tied to an event. What you need to do is clone the event it's tied to and go from there. If you are cloning a past event, click the Past & Archived tab and Search for the old event. 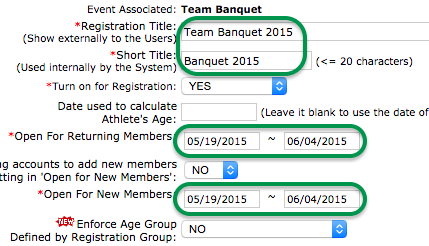 Click [Edit] below the desired event to clone (it will have a Register Online button below it). Change the title, dates and any other relevant details to reflect the new event. Scroll to the bottom and in the lower left click Save Changes to a New Event (Clone), then click OK to confirm. Switch to the Current & Upcoming tab if needed. Click [Edit] below the new cloned event. Below STEP 3 click [eReg Setup]. This will open the Event Registration Setup window. Update the title, registration dates and any other needed data. If needed set Turn on for Registration to YES. If you need to make any pricing changes, click [eReg Setup] again, click the Fees Setup tab and proceed as normal.